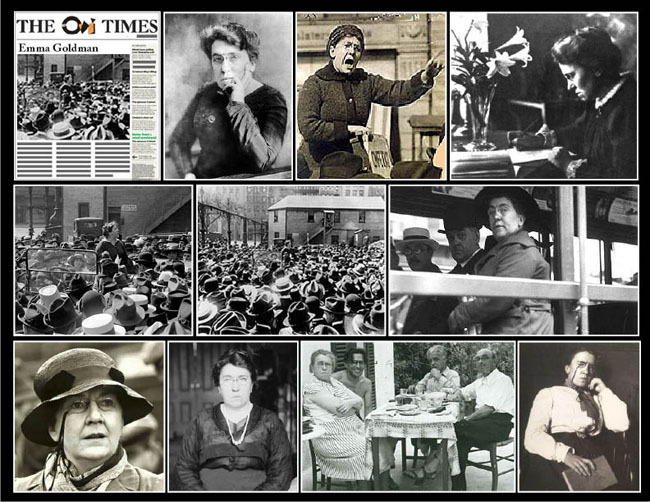 July 10th 1917; Emma Goldman imprisoned for obstructing draft. Emma Goldman, the daughter of Jewish parents, was born in Kovno, Russia on 27th June, 1869. Goldman immigrated to the United States in 1885 and worked in a clothing factory in Rochester before moving to New York City in 1889. Influenced by the libertarian writings of Johann Most, Goldman became an anarchist. Working closely with Alexander Berkman, Goldman became active in the trade union movement. During one industrial dispute, Berkman shot Henry Frick of the Carnegie Steel Company. Berkman was imprisoned and so was Goldman the following year when she was accused of urging the unemployed to steal the food they needed. After she was released from prison Goldman became involved in the campaign for women's suffrage and birth control information. She was in the news again in 1901 when Leon Czolgosz, who assassinated President William McKinley, claimed he had been influenced by the speeches of Goldman. Goldman and Berkman edited and published the journal, Mother Earth, between 1906-1917. Goldman also wrote Anarchism and Other Essays (1910) and The Social Significance of the Modern Drama (1914). An opponent of America's involvement in the First World War, Goldman was imprisoned for two years for obstructing conscription. In 1919 Alexander M. Palmer, the attorney general and his special assistant, John Edgar Hoover, organized a plan to deport a large number of left-wing figures. On 7th November, 1919, the second anniversary of the Russian Revolution, over 10,000 suspected communists and anarchists were arrested in twenty-three different cities. Hoover decided he needed a high profile case to help his campaign against subversives. He selected Goldman as he had been particularly upset by her views on birth control, free love and religion. In court Hoover argued that Goldman's speeches had inspired anarchists to commit acts of violence in the United States. Hoover won his case and Goldman, her lover, Alexander Berkman, along with 246 other people, was deported to Russia. As an anarchist, Goldman was repelled by the Bolshevik dictatorship and after marrying a Welsh miner she managed to obtain British citizenship. Her books, My Disillusionment in Russia (1923) and My Further Disillusionment in Russia (1924) helped to turn a large number of socialists against the Bolshevik government. Goldman moved to France and her autobiography, Living My Life, appeared in 1931. Goldman visited Spain in September 1936 to observe the Spanish Civil War. After meeting leading figures in the National Confederation of Trabajo (CNT) and Federación Anarquista Ibérica (FAI) she went to London and opened a FAI-CNT propaganda office. She also joined with Rebecca West, Sybil Thorndyke, Fenner Brockway and C. E. M. Joad to establish the Committee to Aid Homeless Spanish Women and Children. Goldman also visited Spain in September 1937 and in the autumn in 1938. Emma Goldman was in Toronto when she died on 14th May 1940. The USA government decided to give permission for her body to be buried in Chicago. In case those in love with "savage capitalism" think it proposterous that it is ok for starving people to steal the food they need as Goldman proposed, no less a moral authority than Thomas Aquinas said in his Summa that it is ok for a father with starving children and the impossibility of gainful employment, to steal a few loafs of bread to feed his family and he need not confess it as a sin.